Celebrate Halloween by dressing up as Santa Claus. One of the organizations I'm a member of is rewriting its Code of Ethics, and sent out a survey this morning. It's not a bad one, including things like diversity and setting non-discrimination as a minimum. But it does have a definite bias towards humans as the only consumers of the resources created/manipulated by computers. For now, I guess that's OK, but we will need to address that at some point in the future. Robots will probably address those issues for you. Oh, thank god. I wouldn't want our alien overlords to think we were slacking on these things. That seems more than reasonable to me. I don't want to know. 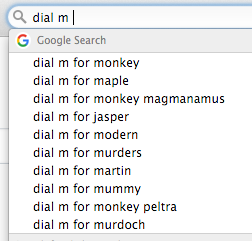 Well, I kinda wanna know why murder is plural. This is a band name cornucopia. Honestly, although much of that is gold, it's just got me wondering about Jasper. The "m" is silent in jasper. So silent, it is not mentioned. According to my closed captioning, "congress and the president are stuck in a stale meat".